Here comes the fuzz! Starsky takes the wheel, Hutch rides shotgun, and comedy runs wild in this hilarious twist on the landmark buddy-cop TV show. 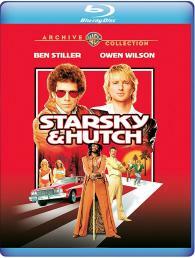 Ben Stiller and Owen Wilson bring a playful chemistry to the roles of undercover detectives Starsky and Hutch. Todd Phillips - The Hangover trilogy directs this 70s groove in which our guys are stripped of their badges, duped by a drug kingpin - Vince Vaughn and totally ripped off in a disco contest. So, yeah, they've got some scores to settle. Snoop Dogg is in fly funkadelic mode as urban coolster Huggy Bear. And Juliette Lewis and others make for nonstop fun. If inducing laughter is a crime, they're all guilty as charged.